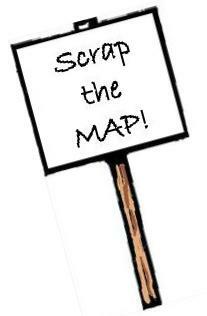 National Day of Action to Support Seattle MAP Test Boycott | Scrap the MAP! Suspend the Test, Not the Teachers! How do we organize parents to boycott the test? Thanks for asking! There are a couple of good resources that I’ve seen on parents opting out of this particular test. The Seattle Education blog had a post on how to opt out at http://seattleducation2010.wordpress.com/2013/01/24/how-to-opt-your-student-out-of-the-map-test/. Creativity Not Control also posted some suggestions for how parents can take action, along with a flyer that can be printed out, at https://creativitynotcontrol.wordpress.com/2013/01/19/test-post-2/. I sent a lengthy letter to Superintendent Banda last week urging him not to take action against the Garfield teachers who have put professional ethics and commitment to students ahead of personal gain. There was an excellent editorial in the Sunday Seattle Times (2/3/13), “The Power of No”, eulogizing Rosa Parks and so many other civil rights workers for having the courage to say no to unjust laws and policies. Without such courageous actions, the Civil Rights Movement might have been stalled indefinitely or passed into the hands of those who urged more violent solutions. Civil disobedience when peaceful and employed by those who are not willing to simply follow orders at any cost is one of the time honored means of change for the greater good in the history of this country. I will certainly be wearing red at work on the sixth (I’m an SPS teacher with nineteen years service) and attending the rally at Garfield where my grandson is a sophomore. I hadn’t heard about the MAP test and have no idea why it is so objectionable. It would be helpful to know what it really is and how it got to be required in schools.